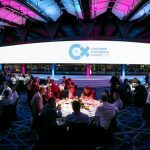 Staging Connections was set the challenge to create a memorable high-end audio-visual feast, worthy of the Volkswagen Customer Experience Summit 2017, which welcomed over 300 participants from across the Volkswagen Australia dealership network at the Hyatt Regency Sydney on 26-27 April 2017. Jason Bradshaw, Volkswagen Group Australia’s Director of Customer Experience, explained that the inaugural Customer Experience Summit had to set the benchmark and deliver an event would motivate the team to be obsessed with delivering a consistently superior customer experience. The event and its elements certainly delivered a WOW to the guests. 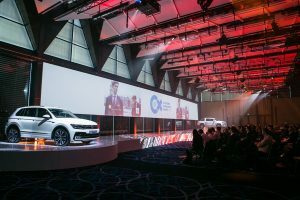 Staging Connections supplied and installed a giant 29m projection screen, on a dramatically long stage showcasing the latest Volkswagen offerings, and highlighted with a stunning lighting design to create a sleek and seamless look. This impressive event delivered a series of thrilling experiences whilst educating and re-affirming to Volkswagen dealers that quality is in the detail, and encouraging them to review the little elements in their sales and service processes to inspire the delivery of a superior customer experience every time. By day the imposing stage hosted international thought leaders and bestselling authors, including Shep Hyken and Scott McKain. While at night the immersive staging was the backdrop for an inspiring speech from Olympic Gold Medallist, Matthew Mitcham, followed by a breathtaking performance from three aerial silks performers descending from the theatrically lit ceiling. Nathan Ryan, Audio Visual and Event Services Manager, Staging Connections was delighted with the impact created by the giant screen and the overall seamless delivery of the event. “The entire team was excited to be working with such a well known cutting edge brand. With Volkswagen being a leader in their field, it was important for the team to create a high-end experience for the guests. The brief was to create a big impression, so we delivered a huge solution! The 29 meter screen spanned the entire length of the Hyatt Regency Ballroom. We framed the screen with Volkswagen Tiguan and Amarok models elevated on a custom gloss white stage to ensure that our clients’ premium product was front and centre. “We designed creative lighting and created customised, engaging content to captivate guests. 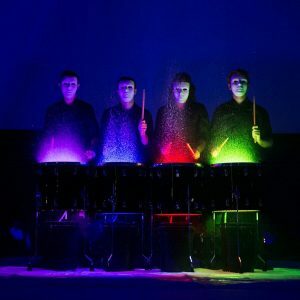 Clever use of projection blending and high impact lighting effects transformed the room and enhanced the entertainment. “Our experienced team ensured that we understood and delivered on our client’s vision. I am very proud of the teams’ flawless delivery for our client,” concluded Mr Ryan. Staging Connections delivered audio-visual, staging, styling, theming and lighting for the Volkswagen Customer Experience Summit 2017.